The Crypton Loopy Bolster Dog Bed Giveaway is open to resident of the USA, 18 years of age or older and at 11:59 p.m. ET on March 3, 2013. One winner will be selected to receive a Crypton Loopy Bolster Dog Bed (Retail Value: $254.99). 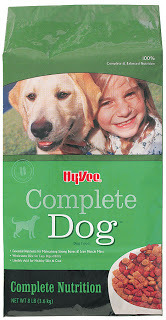 February 22, 2013 – Hy-Vee, Inc. has issued a voluntary recall on Friday February 22, 2013, of certain bags of Hy-Vee dog food due to elevated levels of a toxic compound commonly found in contaminated corn. As per Hy-Vee officials, the recall is voluntary and only conducted as a precautionary measure. No illnesses have been reported in dogs consuming the product, and the product does not pose a health risk to humans handling it. Hy-Vee officials have also removed all potentially affected products from Hy-Vee stores. February 20, 2013 - Nutri-Vet, LLC. of Boise, ID is voluntarily recalling its Nutri-Vet and NutriPet Chicken Jerky Products because they may be contaminated with Salmonella. Salmonella can sicken animals that eat these products and humans are at risk for Salmonella poisoning from handling contaminated pet products, especially if they have not thoroughly washed their hands after having contact with the pet products or any surfaces exposed to these products. For updates and full information visit the FDA Firm Press Release on the recall. February 21, 2013 - The U.S. Food and Drug Administration announced today that Kasel Associates Industries Inc. is recalling all pet treats it manufactured from April 20 through Sept. 19, 2012 due to potential contamination with Salmonella. Kasel has issued three previous recall notices for specific products manufactured during this time period. The Kasel-manufactured products are sold at various retailers, including Target, Petco, Sam’s Club and Costco. Most of the products have a two-year shelf life. All of the products were made in the U.S. This action is not related to FDA’s ongoing investigation of jerky pet treats made in China. To see the full list of what's being recalled visit the FDA Recall -- Firm Press Release. February 21, 2013 - The Honest Kitchen has announced it is voluntarily recalling five lots of its Verve, Zeal and Thrive dog foods because because they have the potential to be contaminated with Salmonella. The items being recalled were produced between August and November 2012 and sold nationwide in the US and Canada via retail stores, mail order and online after August 2012. No other Honest Kitchen batches, production dates or products are affected. The Honest Kitchen Recall has been confirmed by the FDA in their Firm Press Release dated February 21, 2013. Curled up beside the lamp post, bundled so tight that an ant would lose its path, he sleeps. The heavy set fog seems to have forgotten him but he knows better. There are a million corners, far warmer and dry but this is where he has to lie. After all that's his spot. As if a silent alarm has gone off somewhere suddenly the little soggy bundle comes to life. Standing up and stretching he seems oblivious to the cold as he shakes his damp body and with a sense of urgency trots off into the night. The baker's boy, shivering with cold moves a big bag of breads from the van and sure enough there he is standing with an apparent smile. "Hey Tommy" he calls out to him and he reciprocates by revving up his tail. The baker's boy looks around from side to side and quietly tosses a small roll. He pounces on it and with one last wag of his tail, as if to say "thank you" he was off before any of his friends from the neighborhood could find him. After all when you are him, breakfast is not something you can take for granted let alone share. The once silent streets are abuzz with life as the sun was now up quite high. There he was back in his spot lying with his head between his paws, eyes closed shut with contentment, after all the first challenge of the day was over and done. Suddenly he jumps up with a shriek and springs around to look back at whoever it was that had stepped on his tail. "Bloody mutt" shouts a man " is this a place to sleep, you bloody mongrel". With a saddened heart and a heartfelt look he quickly slinks away into a quiet alley, looking back now and then to make sure that the man was not behind him again. Nothing like a nap on a full belly to mend your pride and there he was sleeping away in a cardboard box dreaming of sweet rolls and butter buns and a wagon full of meaty treats jostling by. The sun goes up and over, high in the sky. "Tiger, Tiger, Where are you Tiger?". The head pokes out from the cardboard box and strains to listen intently then like a shot from a catapult bounds off in the direction of the voice. The scrawny little body jumps up and down in tandem with the jumps of the little 9 year old boy. Like best friends forever they greet each other. The boy that no one plays with takes a yellow ball out of his pocket and the sight of the ball makes him go crazy as he runs around from side to side before shooting off after the ball which is still in flight. Picking it up he races back, drops it at the boys feet and shivers in excitement waiting for the next throw. They play on for quite some time while people on the street gave them but a glancing look. As abruptly as it started playtime was over as the boy could hear his mother calling him. Quickly he took out a cookie from his pocket and with that and a pat on the head, he sped off home leaving him alone again. He was so busy munching on the treat that he didn't notice the shadow of the street brute creeping up near him. A deep throated growl got him back to reality and instantly his tail drooped between his legs as he saluted the neighborhood bully. He crouched on the street in submission while the alpha male took over what was left of the treat. While the bully was busy he slunk away back to the alley and the cardboard box. As the shop keeper was getting ready to close his shop for the night, he turned around and saw the little scrawny thing looking up at him. "Hey Jimmy, where have you been all day?" He just looks up and wags his tail as the merchant man took out a bin and emptied it in front of him. The shower of gifts was too good to believe butter buns, half eaten rolls and even a whole loaf of bread. The smorgasbord was too much for him and pretty soon he was joined by four more like him. As the fog crept in through the now deserted streets, not a soul could be seen despite it not even being midnight. In the distance a dog howls sending jitters down the spine of those who are superstitious. The street lamp cast a faint glow and there at the base he was curled up tight, dreamless sleep or a night full of dreams it's something we will never know. He just knows that he has survived another day to be back at his spot. As we pamper our pedigreed pets with lovely names, we forget the hundreds that scrape out a living on the streets. Where streets are called home and meals don't come easy. Yet their lives are not all about hardships but about love, relationships and friendships as well. Nameless to us, yet they have numerous names based on relationships & circumstances. So the next time you run into 'one' on the street remember, he has a story to tell and in it who will you be. This action is being taken because pieces of clear plastic may be found in some bags and could cause a potential choking risk to pets. The source of plastic has been identified and the issue has been resolved. Labradors are incredibly skilled at pleasing their masters or just people entirely. They are great with children and thanks to their inborn tendency to please you can do even more. Building up on that genetic trait you should introduce them to a multitude of people, locations and situations as possible during their early months or years of their life. Keeping the experiences positive will not only influence the lab to be as open and friendly with everyone as possible, but will also boost their natural intelligence by being exposed to so much as they strive to understand it. 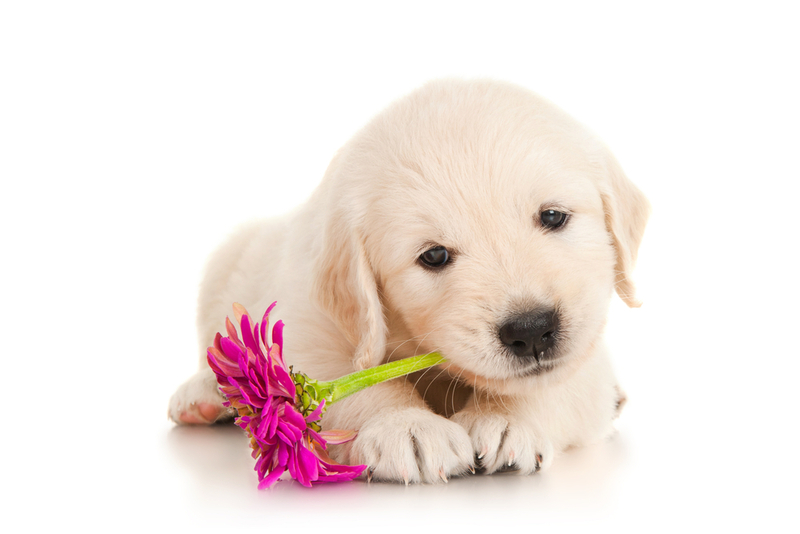 Labs are creatures teeming with energy, making them amazing for active and outgoing families. If you are the quiet, introspective and indoors type then these dogs will be difficult to handle. 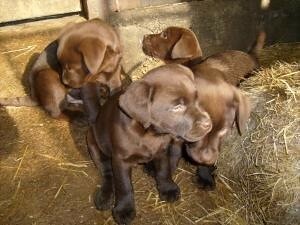 If labs don't get sufficient exercise, running around and socializing they will become bored. This can easily lead to them playing pranks on you by digging, chewing on things, barking and overall wreaking havoc. All that energy needs to be exhausted daily so if you have a lab you must make sure you give them at least an hour a day to socialize and run around. Long walks, playing fetch and chasing each other might be a great way to get them tired and finally able to sit still around your home or yard. Because of their constant playful attitude, eagerness, affection and love of a good meal Labradors are the best dog to train through the use of positive reinforcement techniques. Simply rewarding their behavior with treats, petting, cuddling or playing will be a much more effective tool for learning than using force. You will see for yourself that they are incredibly good at picking up good habits if they are encouraged into developing them. Keep in mind that excessive giving of treats can lead to weight problems if you don't give them enough exercise. Use a limited number of treats for your rewards so you can keep their fitness under control. One thing you have to keep in mind is the fact that Labradors are very active and behave much like puppies for quite a bit of their lives. This seemingly inexhaustible energy will continue well into adulthood as well so expect a lot of activity from your Labrador even years down the line. You will need to keep some things in mind so you can keep them under control. Crate train them so they don't cause havoc around the home while you're gone. Provide them with interesting toys and so on so they can be busy and occupied. Reinforce your education by giving them commands at all times if you are keeping inside and you won't have any problems if done right. You can further their training if you feel like it by involving your puppy with a dog sport or something else to challenge their natural curiosity such as therapy training. This will keep them busy and happy as they learn more about their world. The article has been provided by Angela Harpert - a devoted mom and wife who gladly shares her Dulwich moving experience. Due to her husband's work the whole family are in process of SE22 constant moving, changing homes, environments and people- but the dog and the boys have learned to have good time in this ever lasting adventure. 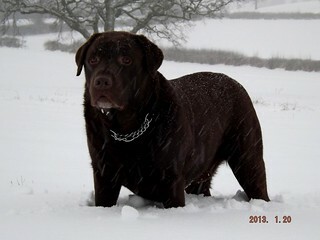 This good-looking chocolate Labrador Retriever goes by the name of Coco, AKA Bredicot Scamper. Coco's photos were sent in to us by Neil from the United Kingdom and he has keep us up to date with some wonderful photos for a few years. 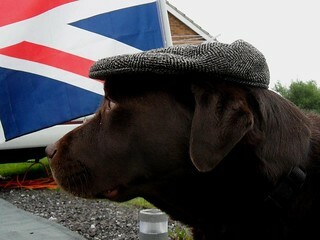 We love watching the growth of this strong and stylish chocolate Labrador Retriever. 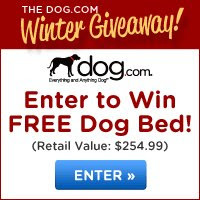 Dog.com is giving you the chance to win Free Pet Food For A Year! To enter the Dog.com: Free Pet Food For A Year Giveaway you must be a lawful permanent resident of the 50 United States or the District of Columbia and be 18 years of age or older. Giveaway ends at 11:59 p.m. ET on February 10, 2013. 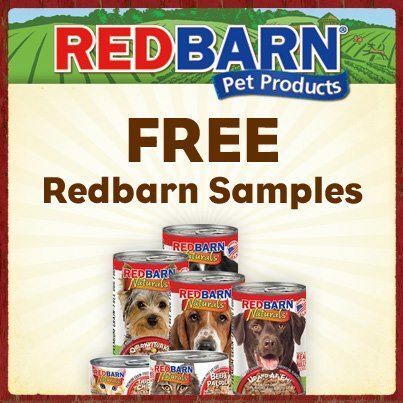 One (1) Grand Prize Winner will win Free Pet Food For A Year ($500 Value)!! Let's face it - dogs just don't live long enough. They wag their way into our lives and our hearts, fill us with love and joy for 10 - 15 years on average and then they're gone. It's important that we spend as much quality time with them as we can during their short lives and help them keep as mentally fit as possible. 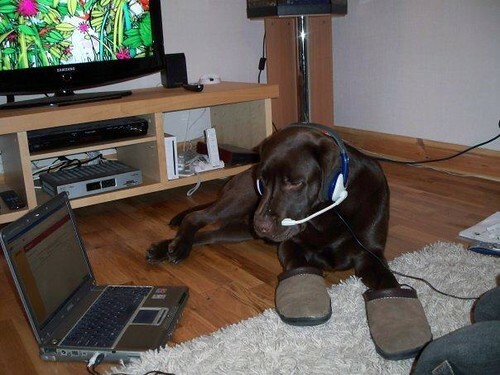 Providing mental stimulation for your older dog is important even if he or she can't get much physical exercise. There are several ways to accomplish this. 1. If you haven't already, put your dog on a regular feeding schedule of twice a day instead of free feeding because dogs actually look forward to meal time. Food is a great mental stimulator. Dogs have a sense of time and know when it's time for a meal and you can be sure they'll be ready and waiting. 2. Read out loud to your dog. I know, it sounds silly, but dogs love to hear our voices - unless, of course, your dog is deaf! I once gained a fearful dog's trust by simply sitting out in the yard with her and reading out loud. I believe our voices have a calming effect on dogs, especially those who may be distressed over not being able to get around like they used to or those who are dealing with arthritis pain or other discomfort. The sound of your voice gives them something else to focus on and mentally pay attention to. 4. Purchasing a dog bicycle baskets and trailers or dog bike basket (for a smaller dog) may be a little costly, but what a great way to spend some quality time with your aging dog. You get the exercise and your dog gets to go along with you, which is really all a pack animal wants - to keep the pack together. 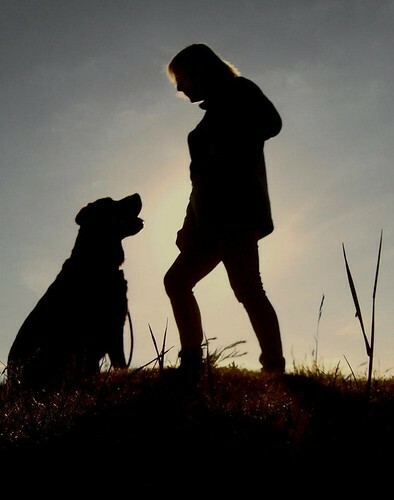 Your dog gets the mental stimulation of all the sights, sounds and smells along the way and of course you can stop anywhere for a short excursion for your dog. 6. If it isn't a warm day, take your dog with you on errands around town. Just remember to never leave a dog in a warm car for even a few minutes since the inside of a car heats up very fast and can cause heat stroke in your dog within minutes. Taking your dog into a local pet shop on your errand run will cause great mental stimulation with all the sights and smells. Maybe even let her pick out a new toy or treat. 7. If your senior dog is still alert and able to learn new commands or tricks, work on teaching something simple, using treats as a reward. Be careful not to over-treat an overweight dog, though. But even a tiny treat is exciting to a food motivated dog. You might teach your dog to "shake hands" or "play dead". There are many books on simple tricks to teach dogs. Learning to use a clicker with training is easy and very rewarding for both you and your dog. Just because your dog may be looking and acting like a senior citizen, don't underestimate the value of quality interaction between the two of you. It is still important to keep his or her brain stimulated and functioning as much as possible. Physical exercise is also very important, even if it has to be at a slower pace than in younger years. Keeping your dog active, both physically and mentally may actually help extend the quality of life for both of you! Karleen Lindsey has worked with dogs most of her life and has been a professional groomer for over 20 years. She has fostered and adopted many dogs and realizes the benefits of keeping them active mentally and physically. To learn more about taking your senior dog along with you on bike rides, check out her review site of dog bicycle baskets and trailers.